* (0:22) Warning: Content is out of order, like Witcher novels or Firefly. * (1:12) Magic button of Annihilation: What Christmas song would you obliterate? * (7:18) Brodeur hates Trans Siberian Orchestra. Dan's ghetto heart isn't satisfied. * (10:20) Dan's exotic pets: An otter! * (0:18) Dan and Chad were quoting Still Talkin (NSFW language warning). * (2:19) Music you listen to at the most formative moments of your life. Jidenna's Long Live the Chief and Method Man's Bulletproof Love. * (0:47) I lied about part 2, but part 1 of my interview with Jim McClure is out! * (2:50) XCOM 2 gets us thinking about setting the level of challenge in a tabletop roleplaying game. * (9:59) Games that get easier versus games that get harder. * (0:28) Much ado about butts. Thanks, Patreon supporters! * (3:35) Was this section even legal to air? * (5:58) Fish Donuts and the foxy Ms. Candida. * (9:15) What happened with the cell phones? 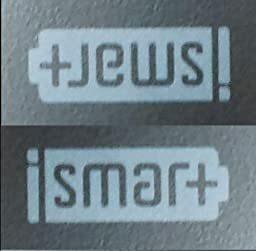 Dan's +Jews! charger. * (20:19) Attention as a precious commodity. * (1:07) Fear the Boot's Secret Santa, run by Noob13. You can find details on the forums. * (2:15) Dan's interview on Talking Tabletop with Jim McClure. Fear the Boot's Twitter and Facebook links.